Using the various NBA tools I have built for this site over the years (see the sidebar on the top right), here are the top performers, top performances, top games, and team superlatives from the 2015-16 season. For the most part, I'm judging players according to win probability added (WPA), which is an admittedly limited metric (it only accounts for made/missed shots, free throws, and turnovers). Least Valuable Player - Rajon Rondo. -4.96 WPA. Granted, this excludes Rondo's other box score contributions, such as assists (where Rondo ranks second in assist WPA) and steals, where he ranks in the top ten. Most Improved Player - The player with the single biggest leap in WPA from 2014-15 to 2015-16 was Kevin Durant, but that "improvement" was due to his injury shortened season last year in which he played just 27 games. 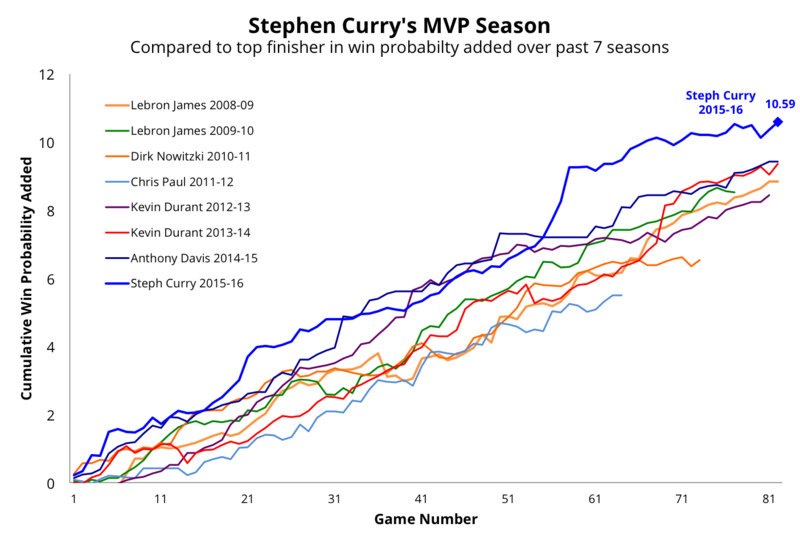 If we set Durant aside, the most improved player this year was.......Steph Curry. Curry won the MVP award last year with +5.75 WPA, and nearly doubled down on that mark this season. James Harden added the most to his team's chances from the foul line, with +2.12 WPA. Note that this measures the value of his foul shooting only. If Harden were an average free throw shooter, his WPA would have been near zero for this category. The least valuable foul shooter this season was Andre Drummond, with a staggering -5.32 WPA from the foul line. To put that in context, if Drummond had been a merely average free throw shooter, this season (instead of an abysmal 36%), that would have meant roughly 10 more wins for the Detroit Pistons (since each team starts at 0.50 win probability and needs to add +0.50 to win, each 0.50 win probability added/subtracted is equivalent to a game won/lost). Of course, if Drummond were a 76% free throw shooter, teams would not foul him nearly as much. Using this site's Top Games Finder, we can rank the best games of the 2015-16 season. 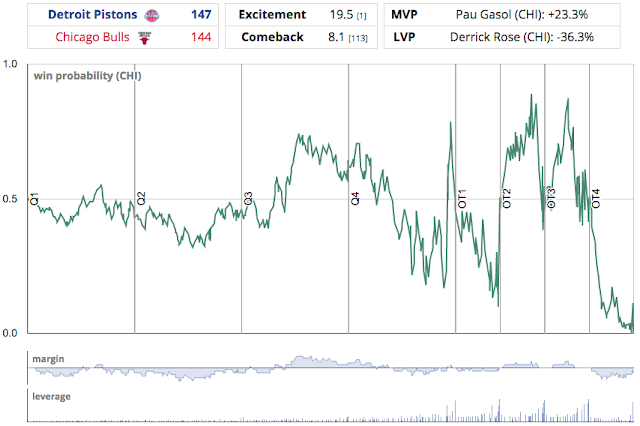 Most Exciting Game - According to the Excitement Index, which quantifies how much the win probability graph "travels" over the course of the game, the most exciting game was the quadruple overtime contest between the Bulls and the Pistons on December 18. 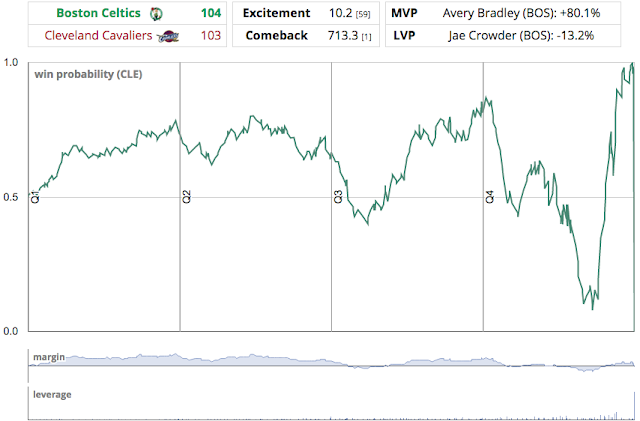 Biggest Comeback - The Boston Celtics were down five against the Cavaliers with 0:09 left in the game, and Avery Bradley had just missed a three pointer that would have brought them within two. At that point, prior to the rebound, the Celtics win probability was 0.1%. However, thanks to an offensive rebound, a Jae Crowder three pointer, and a potential three point play that turned into, effectively, a five point play, the Celtics won on Avery Bradley's buzzer beating three pointer. MVP Performance - In a January 25 game against the Kings, Charlotte's Troy Daniels scored 28 points off the bench, going 8-11 from three point range, and hitting two clutch shots late in the game: a layup to tie the game with 1:05 left in the first overtime, and a three pointer to take the lead, and ultimately the victory, with 0:09 left in the second overtime. Daniels finished with +112% WPA, the largest single game total this season. Oddly enough, the second highest WPA total took place in the same game, with the Kings' Demarcus Cousins dropping 56 points and adding +108% WPA in a losing effort. Other notable performance include Stephen Curry's +100% WPA performance against the Thunder and Kobe Bryant with 60 points and +46% WPA in his final NBA game. Most Exciting Season - The Indiana Pacers had, on average, the most exciting games this season, with an average Excitement Index of 6.82. Least Exciting Season - The Spurs had the least exciting games, with an average Excitement Index of 5.13. Sometimes boring is good. Most Dramatic Victories - Each game is assigned a comeback factor, which is the winning team's odds at their lowest point. The higher the factor, the bigger the comeback. By that metric, the Houston Rockets' victories were the most dramatic. Their average comeback factor in victory was 3.46. Most Heartbreaking Losses - It should come as no surprise to fans of the Thunder that their team leads the league in this category. The average comeback factor for their losses was 4.53, well above any other team in the league.